This data series series did not include Q1 2011 data at time of posting. The Dagong Global Credit Rating Co. Ltd. is a credit rating and risk analysis research institution founded in 1994 upon the joint approval of People‘s Bank of China and the former State Economic & Trade Commission, People’s Republic of China. Think of it as an informational and policy utility. They accuse the United States, "the world's largest debtor country" of waging "global credit warfare"presumably by excessive monetary expansion (printing money) and excessive debt issuance. One infers that they appropriately fear a declining US$, a rising Yuan, and an inflationary collapse of the US bond prices, in essence a devaluing of their holdings. Kudos to Ms. Mary Meeker and her firm, Kleiner Perkins Caufield & Byers. They have done a public service by putting together a comprehensive analysis, USA Inc., that tries to answer the question, "What if we looked at our country as a business and applied some related analytics & disciplines?" I only wish it had gotten more visibility. Some of the analysis is compelling, and stunningly, much of this basic data is simply not surfacing from the imbecilic cacophony of mugwumps in media, policy or politics. We can understand why the politicians don't want these pictures to see the light of day. Broad understanding would reveal the great unpleasantness and failure of political leadership that brought us here. They communicate quite clearly what our problems are. Our balance sheet is fraudulent in that it does not disclose all liabilities. When we put those liabilities on the balance sheet we become book insolvent. So the next time a politician says the words "trust fund" make sure that he means that an independent, non-governmental third party trustee will hold the funds for your benefit. And our debt outstanding only reflects what's the on balance sheet! Through the wisdom of governmental accounting orange stuff above isn't reported as a real obligation on the balance sheet! In the private sector this omission would be garden variety 10(b)(5) fraud but as Marilyn Monroe once said, "It's different for girls..." so when you start thinking about the debt crisis, don't forget to put the orange stuff on the balance sheet. The omission is a fraud: a game of 'Hide the ball' that government has played so long. Game over. Lastly, while we're spending a lot on defense it does not appear to be out of line historically. Spend some time with the study & share it with fellow citizens. I'm not buying into all the recommendations as some obvious private sector solutions have been given short shrift (more on that later), but defining the problem is a first step to solving anything. And folks, that's the home team voting with their feet. We're flattered to see WWB's Commentary leading the way for the WSJ, and note the date of their article today: America's Debt-Ceiling Opportunity by Emil Henry. WWB states it's bias in favor of beta driven returns and longer term asset allocations (i.e. construct portfolios of various asset classes and execute through low cost indexed product). Of course, this approach is based on a variety of assumptions, and it is certainly possible, if not probable, that some assumptions vary as to degrees of reliability or confidence over time and circumstance. We do not live or invest in a perfect world. There are limits to information and analytic & computational capacity, and it is unlikely that any retail or small institutional investors are anywhere near them. We would argue that most medium to large institutions are nowhere near them. Here's a good and free example of the lower end of what's available. Here Google Domestic Trends charts the number of web inquiries against DAL. We stipulate it's pretty cool, but bear in mind this is so primitive, its free ... the lowest grade of analytics available. And what you do with this is not clear: do rising inquiries foretell more passenger/miles? Or a change in consumer elasticity providing less revenue/mile/passenger? Does cancer cause smoking or vice versa? I recall a hedge fund manager once showing me a similiar chart of entirely different variables. He closed his presentation with "It's a no brainer. I can trade that. Anyone can trade that." Perhaps, but nevertheless we declined to pay him for the priviledge of testing his hypothesis with our money and granting fees that vested as his call option with asymetrical treatment of our downside risk (heads I win, tails you lose). The next time you want to buy an individual security, think about this example, but extend it to every asset class and security around the globe and do it on a real time basis. What do you know that everybody else doesn't? If you don't have a good, hard, and legal answer to that question, you'd better worry about the converse. As one of our associates commented in a strategy discussion as to the state of analytics and theory, "Look we know that Newtonian physics don't work all the time, but it's pretty tough to build a bridge without them." And we are looking to build bridges, if not bombshelters, across which we, our families, and clients, can walk. The Swiss National Bank (SNB) will no longer accept Irish government debt, and that of several of the country's major lenders, in its repo operations. This is a significant adverse credit judgement. We look for others to follow and ultimately other weak countries will be added to the list. Some one will have to finance this stuff... just not the Swiss. Evidently, the Swiss do not see their primary role as protecting the Irish government or selected Irish banks from the consequences of bad policy. The Adam Smith Institute reports that European nations have started to sieze private pension assets: Hungary, Poland, Ireland, and Bulgaria have all joined the party, although by slightly different means. It is an example of financial oppression of citizens by governments. This is a preview of coming events in the US. One suspects that given the massive underfunding of many state & municipal pensions and the pending insolvency financial stress of various municipalities & states, politicians will give it a go. Morgan Stanley put a bold warning in the public domain and to their credit used the exact words, "financial oppression" which we noted in our posting The Last Chance Saloon of Sept. 1, 2010. They were spot on. The trend will accelerate in Europe where portable assets & black markets will soon trade at an even higher premium. The US political class will face a hard choice: non-trivial real reductions in transfer payments and government spending or take a shot at this kind of oppression. These economic wheels grind slowly, but very finely. Watch your exposure to the estate and effective marginal tax rates at the state & national levels. Make sure you know what you own. Maybe the Fed doesn't have Yahoo or Google finance? Those of us who are color blind may have difficulty discerning the finer points, but in some sense the colors don't matter. The blink test is sufficient. Annualize the gains, and you get some non-trivial numbers. The only things going down are the US $ and the credibility of the Fed. Oh, we forgot, short US interest rates too ... with thanks to Johannes Gensfleisch zur Laden zum Gutenberg who invented the essence but not the jargon of 'quantitative easing'. Check writing in the trillions is not a bondholder’s friend; it is in fact inflationary, and, if truth be told, somewhat of a Ponzi scheme. We hope to be your global investment authority for a new era of “SAFE spread” with lower interest rate duration and price risk, and still reasonably high potential returns. For us, and hopefully you, Turkey Day may have to be postponed indefinitely. Oh, my. We don't necessarily disagree with his analysis, but find the style a little heavy handed... but that was before the Asian finance ministers cut loose with the 12 guage OO buck shot. Of course, over the weekend, right in the middle of this drafting, all hell broke loose in a Fresh Attack on Fed Move . We confessed our bias to short duration some time ago and suggest everyone watch the 10 year Treasury. We suspect there will be some credit turbulence in Europe. Let's just hope it stays there. Pending sensible resolution of some of the major fiscal, trade & regulatory issues, there is still a fair amount of risk that could quickly compound or boomerang. We don't believe the nominal rise in equities is a panacea, although we'll take it, and we think there is still a fair bit of political & policy risk implicit in these price levels. If the Fed and Congress have gotten a whiff of the smelling salts, it will have been a good start. One suspects the Fed has already damaged its credibility, and if they keep pushing the Gutenberg agenda as a proxy for the failure of tax and fiscal policy, the public may very well ask the bald question: "Why do we need more monkeys throwing darts?" The data in the graph was as of approximately 11.15 AM EDT on Nov 1, 2010. It seems to have been a reliable indicator of the actual outcome. Here it is: Office of the Inspector General for the Troubled Asset Relief Program of Oct. 26, 2010. But the exposure to investors that Morgenthau was getting through the gold purchase project of 1933 was already teaching him something. Investors didn't like the arbitrariness. It took away their confidence. One day Morgenthau asked FDR why the president had chosen to drive up the price of gold by 21 cents. The president cavalierly said he'd done that because 21 was seven times three, and three was a lucky number. Cash for Clunkers, why cars? Why not computers? Or your children's education? Lawn mowers? Dishwashers or drilling equiptment? Hogs? Who knows? Why should you subsidize your neighbor's new car when your elderly parents need financial support? And why the $4,500 rebate? Why not $4,600 or $4,450? The first drilling moratorium, opposed by the presidential commission but misrepresented by the administration, was reversed by the courts leading to a second moratorium, no doubt to be litigated but wait now its "OK, guys go ahead!" But wait, you need extensive recertification. Do you think owners of scarce rigs will hang around and wait for the drama or hit the bid to go abroad? Or consider the pure whimsy of estate tax, an inverse case of 'now you see it, soon you won't', 0% today, 55% Jan. 1, 2011, or maybe not. Or consider the unfathomable complexity of the entire code which according to CCH the US Tax Code now approximates 67,505 pages. Or consider the whimsy of administration: as of this writing no one knows the tax rates to be effective for personal rates next year. What happened to the rule of law governing status of the senior secured creditors of Chrysler debt? Extra legal persuasion? Danny Ortega style? The full 100% payout of counterparties of AIG's credit default swaps courtesy of the US taxpayer. The mysterious & all powerful Fed and the current structure of manipulated interest rates that penalize risk averse savers, among them particularly the elderly and those who can not prudently tolerate higher risk assets? Rationing and arbitrary benefit decisions under the new national health care plan. The arbitrary reallocation of some 34% of US corn production to ethanol corn which had the unintended consequence increasing commodity prices (~doubling corn farm prices) & inducing starvation in emerging countries that relied on non-ethanol corn. The unfathomable complexity of Dodd-Frank: 2,319 pages requiring multiple new federal entities yet to be created and 248 regulations yet to be written (nearly 100 at the SEC alone) and 67 studies to be conducted. Plan around that, my small business friend. The destruction of the value of the US$ and the incessant mau-mau'ing of impending trade wars. Congress exempting itself from compliance of law & regulations imposed on the citizenry. The wanton and willful destruction of the most important element of our economy, small business and farms, by operation of the inheritance tax. No business survives the loss of half of its capital every generation. Our problems arose from the cumulation of distortions and mis-allocations of capital mostly induced by the corruption of law, regulation, and leadership. We concede some base level of manifest error, but in our view it is corruption operating in absence of appropriate checks and balances. When countries mis-allocate capital badly over time, the standard of living declines. Productivity counts. The primary problem is that our tax code and budget process have become instruments by which Congress monetizes its ability to dispense economic favor. You don't need 67,505 pages and the K Street lobbying industry to treat people equally. And everybody knows it. Consider the sheer magnitude of the unproductive burden of tax compliance on citizens and business alike. We now have whole industries and legions of tax lawyers and accountants dedicated to intermediating an unfathomable, incomprehensible extraction of wealth by the government where by compliance is impossible by virtue of complexity, so enforcement becomes discretionary. And out of this process comes not one wit of real production, not one loaf of bread, not one bucket of bolts, not a single chip or Ipad. Nothing but sludge and friction and now sobering, if not heartbreaking, macro costs. Keep it simple, so everyone can understand the deal without engaging a Wall Street law firm. Eliminate Congress' ability and inclination to corrupt itself and the process so essential to the well being of our country. Until then three is still a lucky number. The fraud of Social Security becomes the fraud of General Motors becomes the fraud of California and moves soon to a theatre near you. Owners of municpal paper take note. The FT today reports US cities face big public pension deficits excerpted below. Big US cities could be squeezed by unfunded public pensions as they and counties face a $574bn funding gap, a study to be released on Tuesday shows. The gap at the municipal level would be in addition to $3,000 bn in unfunded liabilities already estimated for state-run pensions, according to research from the Kellogg School of Management at Northwestern University and the University of Rochester. Now how could that have happened? Thematically, its the same old stuff. Shall we take a little flashback to General Motors? Kudos to Tony Jackson of the Financial Times for his article GM is just a hedge fund in disguise (Aug 22, 2010 also excerpted below). As public offering for GM rev’s up, one might well ask, “How is this going to work?” Well, it’s not going to. The US government, or rather the current & future US taxpayers, have provided us with another opportunity to short a pig. Let’s set aside the sobering competitive reality that we as consumers already know well. No one buys their cars. That’s why they went bust. Let’s further set aside the sobering global competitive threats of Ford, Honda, Toyota, and Hyundai. GM has pension liabilities of some $100 billion, funding of which is well, running a bit short. Quelle surprise! The stated deficit of some $27 billion bananas is, of course, based on the assumption that the existing pension assets earn 8.5% for the rest of time in eternity AND that GM operates with sufficient profitability and cash flow to fund its pension expenses and everything else. Well, good luck with that 8.5%. What…? You need a bigger number, no problem? Just pop the asset mix and up risk a bit. Why not? The reality of all this is that GM…is in economic terms a hedge fund, with its operations a mere sideline. And as a hedge fund, it is fairly racy. Mr Ralfe calculates that only 35 per cent of its assets are in investment-grade bonds, either Treasury or corporate. The rest is spread across real estate, equities, hedge funds, private equity and so forth. This poses an interesting question. Why would investors put their money into GM, rather than into regular hedge funds that are not distracted by the vexing business of selling cars in competition with the giants of Asia? Oh, good. But wait, there’s more. The first half operating earnings of GM were about $2.9 billion (the highest since 2004) so let’s double it to ballpark 2010’s annual operating earnings, well, call it a little less than $6 billion. Let’s set aside the hockey stick earnings forecast by management and soberly assume that the 8.5% sustainable investment return on the pension assets is overly aggressive, at least at the front end of the period. GM then has to dedicate at least all of its operating earnings for the next 6-8+ years minimum to merely funding the pension liability. Forget about growing warranty expense or debt service or funding unsold inventory. Kaboom! We’re all shareholders on this bus. Flash back to GM: GM’s annual payments to its US pensioners are running at $9.3bn. On US fund assets of $85bn, that ostensibly requires a return of 10.9 per cent. Flash back to the Social Security trust fund: there is no social security trust fund. The WSJ reports that the “U.S. government could continue to be a shareholder in General Motors Co. for several years as it gradually reduces its majority stake, Chief Executive Dan Akerson said Thursday.” Yes, several more years, indeed. ed - oops, some of the initial editing didn't take. Fixed now, we hope. The data below, estimated by Joshua Ruah an associate professor of finance at the Kellogg School of Management at Northwestern University, needs to be supplemented by the list of the 11 best states so we may observe an object lesson in the mobility of capital that will accompany the progress of time and increases in tax burden of these states (the following excerpted from linked article). We recommend the analysis of Ask Not Whether Governments Will Default But How? (Mares of Morgan Stanley: Aug 25, 2010) as an important work for those who wish to understand the nature of the problem with global sovereign finance. It proposes the notion of “financial oppression” of citizens (or more broadly holders of capital) as a viable strategic alternative available to central banks and governments in lieu of default. This is bold language for Morgan Stanley, a mainstream global house, to use publicly in our brave new regulatory world. We commend them. The analysis is spot on. For those with a tolerance of flippancy (if not rude language) but who also appreciate clarity of logic, we also suggest A Termite Riddled House. It complements Mares’ line of thought for those who might need to grok differently and also happens to have a link to one of the most instructive graphs, a time series, of the Fed’s balance sheet. the banks buy treasuries and ride the yield curve to profitability. That’s where we are. The toxic assets are still there, still hanging around. Look at the balance sheet of the Fed. Look at the increase of federal debt. The strategy of the Fed is very clear. The nature and magnitude of the macro economic problems are so large and complex that resolution of the problems is not feasible from their perspective as a practical or political matter. Scale, complexity, and time make for diverging rather than converging sets of solutions. The cone of possible outcomes they see gets wider and more chaotic. in favor of inducing controlled, chronic inflation to buy time and stability. Default is off the table. The Fed has no more ideas, options or ammo. That’s it. What does this all mean? It means we anticipate the Fed will induce structural inflation, which they hope will be moderate, as a best case outcome. We wouldn't go long duration just right now or anytime soon. Those who follow us know we've been inclined to shorter duration and investment grade credits in fixed income for some time. We concede the spread party is over but are content with investment grade spreads for now. We like TIPs as a segment of fixed income strategy. We have been following the muni market with some concern, noting that capacity to repay declines dramatically when you no longer have either cash or a viable tax base. We'll re-consider when we see the risk premia reset (note Harrisburg defaulted on a payment of a general obligation bond today). If we could buy renminbi bonds, we'd think about it. As things currently stand we do not anticipate deflation. However, here we come to the uncertainty part, the 'as currently stands' part. It's unclear on the margin how much more imprudent policy and uncertainty we can tolerate without setting off a chaotic response. The lack of experience in the executive and leglislative branches now adds risk. They don't understand that if you push it hard enough, it will fall over. The bi-polar mind sees two ways to hit the reset button: a hard reset to equilibrium by crisis of either inflation or deflation. The temperate and optimistic see that with sensible & timely reform we can fix this. When was the last time you saw sensible & timely out of Congress? November might well be the last chance saloon. Funny how the equity market goes up when the dividend yield exceeds the 10 yr Treasury rate, isn't it? We will leave for another day the consideration of the hypothesis that in the main the citizenry lacks the capacity to understand what got us here, and therefore we lack the political capacity to resolve it (c.f. dependency ratio > 50% and failures of the educational system). Also thanks JS for correcting the error of 'grock' to 'grok'. But something weird happened this week in Treasury inflation-protected securities, or Tips, US inflation-linked government bonds. For only the second time in history, the five-year Tips offered a negative real yield; that is, buyers get back less than inflation. Why would anyone want to buy an inflation-protected bond that is guaranteed not to protect fully against inflation? Perhaps if inflation were expected to be very high, prompting a rush for even partial protection. But that is hardly the case today. Rather, it is because Tips investors expect inflation to be higher than nominal bond yields: only by one hundredth of a percentage point, but enough to make it worth buying Tips with a definite real loss rather than straightforward bonds. The substance of this phenomena is worth thinking about. Seems to us this analysis is just about right, although risk preference may come in to the calculation as well. 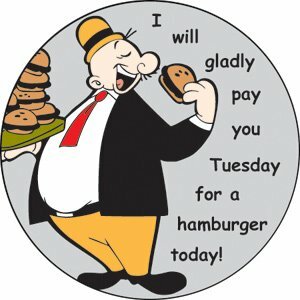 Deflation, of course, brings a whole new meaning: "I would gladly pay you less on Tuesday for a hamburger today." What to do? We think not much and certainly nothing rash. The key is the longer term strategy. Those, including ourselves, who have genetic disposition to chronic fear of inflation, would do well to consider the substance of the market view that any pick up in aggregate demand may not eventuate in the near to intermediate term...or even later. The bond vigilantes counter argue that the only actionable solution is to monetize the debt by inflation (check the CBO report below). Certainly, in the context of fixed income portfolios, the quest for real value will chafe against the avoidance of risk (do no harm), and the uncertainty in the markets once again suggests that the basics of diversification and risk management are essential. We thank a reader for bringing to our attention a newsy story on MarketWatch covering the municipal bond markets, Municipalities on the brink, but muni bonds hang in there. The article is worth a read if only for a bold market call. We beg to disagree with just about every dimension of this perspective. The Congressional Budget Office just released an important study, Federal Debt and the Risk of a Fiscal Crisis, July 27, 2010. The good news is that we have the analysis. The bad news is akin to the cart before the horse. The country needs this analysis before of the decisions get made, so citizens may make informed, reasoned decisions. Congress and the Administration turn a willful blind eye to such nicities, by operating in such a way that prohibits the free, open, and timely dissemination of such information to the citizens. Read the fine print and learn that Alternative Fiscal Scenario is where we're heading. Its ugly. What options does CBO present as available to cure the problem? Three out of four are problematic... at least for economic viability. No, we're not making this up. Read the article, learn of government debt/gdp of Argentina (50%), Greece (110%), and Ireland (70%). Now square the picture above with the current US Treasury rates. "WASHINGTON (AP) -- Some major health insurance companies will no longer issue certain types of policies for children, an unintended consequence of President Barack Obama's health care overhaul law, state officials said Friday. Florida Insurance Commissioner Kevin McCarty said several big insurers in his state will stop issuing new policies that cover children individually. Oklahoma Insurance Commissioner Kim Holland said a couple of local insurers in her state are doing likewise. In Florida, Blue Cross and Blue Shield, Aetna, and Golden Rule -- a subsidiary of UnitedHealthcare -- notified the insurance commissioner that they will stop issuing individual policies for children, said Jack McDermott, a spokesman for McCarty. The major types of coverage for children -- employer plans and government programs -- are not be affected by the disruption. But a subset of policies -- those that cover children as individuals -- may run into problems. Even so, insurers are not canceling children's coverage already issued, but refusing to write new policies..."
Many are of the view that this phenomena is not an unintended consequence, that it is by design of policy. It is a logical and predictable response to cost structures and burdens imposed by the new 'health care reform'. We predict more insurers will follow and that health care providers across different sectors in increasing numbers will start to limit treatment or otherwise refuse to accept reimbursement schedules that cause them to incur losses.